The old Denver & Rio Grande Western Railroad San Juan Extension, now called the Cumbres & Toltec Scenic Railroad, is a Twin Rivers Cabins and RV Park guest day-trip favorite. The train’s depot is but five miles from our location and is widely considered America’s most spectacular, longest and highest narrow gauge steam railroad still running. 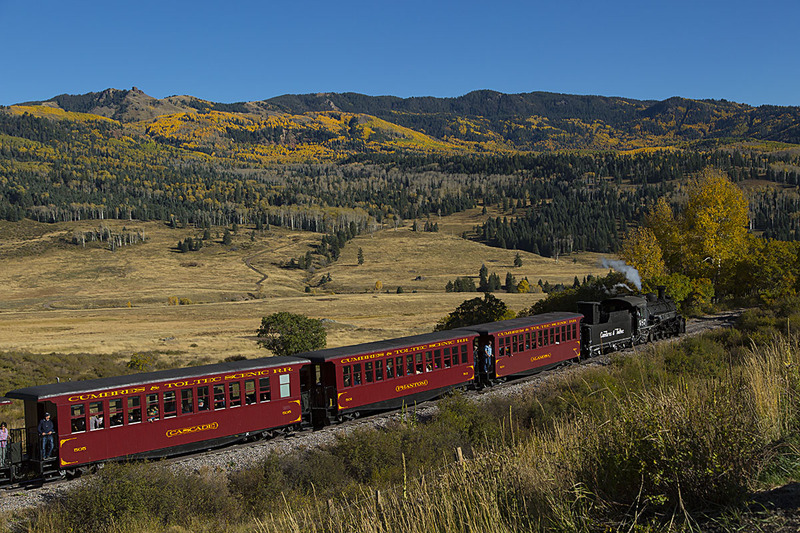 The steam-powered train will take you on an real adventure back in time as it meanders through 64 miles of awesome Colorado Rockies mountain peaks, pristine valleys, tunnels, gorges and seemingly endless breathtaking vistas all the way from Antonito, Colorado to Chama, New Mexico, over Cumbres Pass. It was placed in the National Register of Historic Places in 1972 with additional documentation approved in 2005. The National Historic Landmark designation recognizes the railroad’s significance between 1879 and 1929, beginning with construction of this segment to when its modernization ceased. The Denver & Rio Grande Western Railroad, successor to the D&RG, did not substantially change operational or maintenance practices after 1929. The 64-mile route straddles the Colorado-New Mexico border on the western edge of the San Luis Valley and is an outstanding representation of the larger 1,000-mile network that opened the central Rocky Mountain region for development. The right-of-way includes narrow gauge track in its original alignment, depots, water tanks, trestles, telegraphone booths, section houses, tunnels, livestock loading pens, ten steam locomotives, and more than a hundred other pieces of rolling stock. The often-called Narrow Gauge Movement of the late nineteenth century was one of the most distinctive periods in American railroading. The historically important network defined by the Denver & Rio Grande, its affiliated companies, and especially the San Juan Extension represented an ambitious, extensive, and successful expression of narrow gauge (36″) railroading as an alternative to the prevailing system of standard gauge (52 ½”) track. The segment served as a de facto narrow gauge “proof of concept” project demonstrating the ability of 36″ railroads to penetrate mountainous regions, operate over long distances, and scale equipment and infrastructure to meet heavy traffic demand.